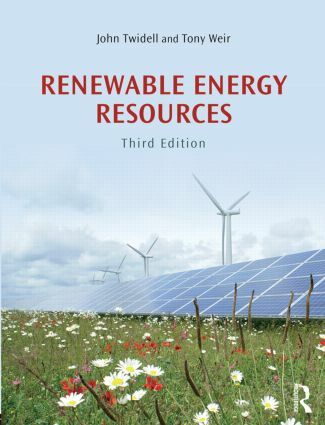 Renewable Energy Resources is a numerate and quantitative text covering the full range of renewable energy technologies and their implementation worldwide. Energy supplies from renewables (such as from biofuels, solar heat, photovoltaics, wind, hydro, wave, tidal, geothermal, and ocean-thermal) are essential components of every nation’s energy strategy, not least because of concerns for the local and global environment, for energy security and for sustainability. Thus in the years between the first and this third edition, most renewable energy technologies have grown from fledgling impact to significant importance because they make good sense, good policy and good business. This Third Edition is extensively updated in light of these developments, while maintaining the book’s emphasis on fundamentals, complemented by analysis of applications. Renewable energy helps secure national resources, mitigates pollution and climate change, and provides cost effective services. These benefits are analysed and illustrated with case studies and worked examples. The book recognises the importance of cost effectiveness and efficiency of end-use. Each chapter begins with fundamental scientific theory, and then considers applications, environmental impact and socio-economic aspects before concluding with Quick Questions for self-revision and Set Problems. The book includes Reviews of basic theory underlying renewable energy technologies, such as electrical power, fluid dynamics, heat transfer and solid-state physics. Common symbols and cross-referencing apply throughout; essential data are tabulated in appendices. An associated eResource provides supplementary material on particular topics, plus a solutions guide to Set Problems. Renewable Energy Resources supports multi-disciplinary master degrees in science and engineering, and specialist modules in first degrees. Practising scientists and engineers who have not had a comprehensive training in renewable energy will find it a useful introductory text and a reference book. John Twidell has considerable experience in renewable energy as an academic professor in both the UK and abroad, teaching undergraduate and postgraduate courses and supervising research students. He has participated in the extraordinary growth of renewable energy as a research contractor, journal editor, board member of wind and solar professional associations and company director. University positions have been in Scotland, England, Sudan and Fiji. The family home operates with solar heat and electricity, biomass heat and an all-electric car; the aim is to practice what is preached. Tony Weir has worked on energy and environment issues in the Pacific Islands and Australia for over 30 years. He has researched and taught on renewable energy and on climate change at the University of the South Pacific and elsewhere, and was a Lead Author for the 2011 IPCC Special Report on Renewable Energy. He has also managed a large international program of renewable energy projects and been a policy adviser to the Australian Government, specialising in the interface between technology and policy. Please visit the following link for a Q&A with the authors about the importance of the new edition, what it includes, and the state of the field! The information in this eResource supports and supplements the 3rd edition of our university and college textbook on the science, technology and applications of renewable energy. At each new edition, we find that the central and associated subjects have grown extensively, so despite the noticeable increase in length, some material has to be left out. This eResource allows us to make such material from earlier editions available to present readers. In addition, we have other related information and articles that can be included here; all within the title of Supplementary Material. The authors intend to update the e-Resource from time to time;some updates added in May 2016 are listed below. The material is predominantly ‘open-access’. However, the eResource also includes additional information for instructors, such as guidance for solving the Set Problems of each chapter. Access to this information is only by password provided by the publisher to accredited instructors. The authors welcome comments on this material and any other aspects of the book, not least any errors you may spot. Comments may be sent to amset.centre@gmail.com or to tony.weir@anu.edu.au. Each of the items referred to below in this Supplementary Material has a number like Sx.y , where x is the chapter in Renewable Energy Resources to which it is most closely related. Article published in Journal of Pacific Studies, vol 32(2), pages 4-30 (2012). SR4.1 Periodic table of elements. Note that Renewable Energy Resources, like most of the semiconductor physics literature, uses the ‘old’ [Roman numerals] notation to denote the groups of the periodic table, as explained by Wikipedia. This extensioncovers the case where ‘A yields B’ , rather than A=B as a physical identity. Each of the 17 chapters in our book ends with a set of Problems. These refer to material in the particular chapter and most require quantitative analysis. The standard of the Problems varies considerably. A few merely require data to be plugged into the appropriate equation in the text; most require some independent thought and awareness of broader issues; others (usually marked * ) are opened-ended and best considered in a tutorial or class context with direct guidance from the instructor. We encourage students to be questioning and critical. It is good practice if they try to estimate by ‘gut feel’ the order of magnitude of answers before they start formal analysis. They should record such estimates and compare them with their final analytical answer; often the estimate is correct and the formal calculation wrong, because of a mistake in calculation that is then found by careful checking. Our worked solutions include comments and detail to save the time of Instructors and to give suggestions for discussion. There are a few Excel spreadsheets included in this e-Resource; they are used in the solutions for chapters 8 and 17. We hope these are useful for you and we welcome feed-back. Please email your comments and ideas to John Twidell (amset.centre@gmail.com) and Tony Weir (weirtoabs@yahoo.co.uk). To download the instructor material, please register for access to the Instructor Downloads page. One of our sales reps will provide you with a username and password, in order to download the files.